Project Fi is now running another promotion on the Moto X4. If you buy two, you get $249 of service credit - essentially making the second phone free. That's not a bad deal at all, especially considering the X4 has Android 8.0 Oreo, a Snapdragon 630 processor, a 1080p LCD, and dual 12MP cameras. One $249 service credit applies to an individual user on a Fi group plans who buys 2 Android One Moto X4 devices from fi.google.com to be activated by 2 users who are a part of a shared Project Fi group plan. One user must purchase both devices, and the credit will be applied to the purchaser’s account. Activation of both devices is required within 30 days of device shipment. This offer is valid from April 3, 2018, at 12:00 AM PDT–May 2, 2018 at 11:59 PM PDT, or while supplies last. Users must be active for 21 consecutive days to be eligible to receive credit. If one device is returned, the credit will not be distributed. This offer is only available for U.S. residents ages 18 and older with a Google Payments and Project Fi account. Limit is the smaller of 6 Android One Moto X4s or the size of the group plan. 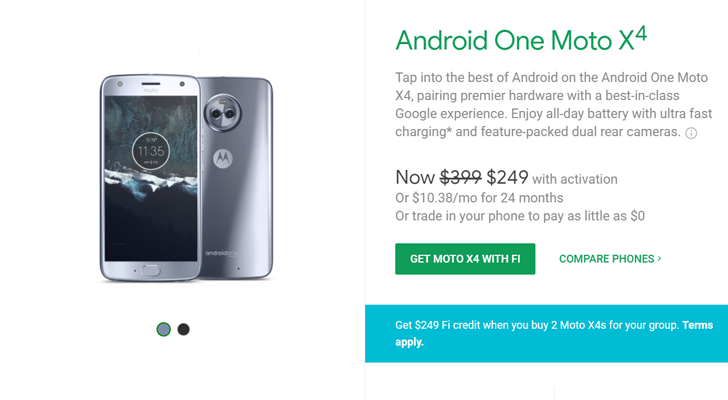 This offer can be combined with ongoing $150 off with activation discount on Android One Moto X4s purchased through Project Fi, and terms are subject to applicable laws. The offer is void where prohibited. If you're interested, you can buy the Moto X4 from Project Fi at the source link below. It's a referral link from Cody, so unless I'm missing something in the terms, you'll get an additional $20 of service credit.